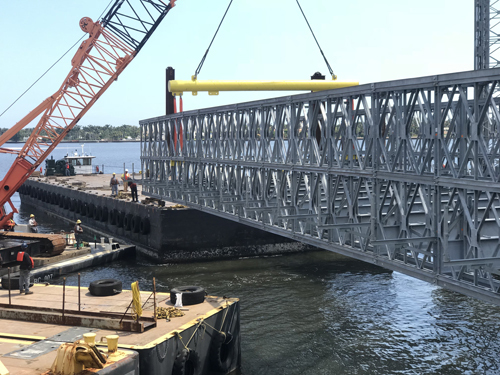 The temporary bridge between Palm Beach and West Palm Beach is expected to be in place until completion of the project, now estimated for winter 2020. When the existing bridge was found to have structural problems and the decision was taken to build a new crossing, a temporary span was required to accommodate heavy vehicle traffic on the highway as well as commercial and recreational vessels on the waterway during the lengthy construction period. The lift span purchased from Acrow Bridge is 51.8m long with a roadway width of 9.2m and a cantilevered footway. It is supported by four 22.9m-tall towers and a 53.3m gantry system which is on top of the towers. The structure is designed for an AASHTO HL-93 loading. 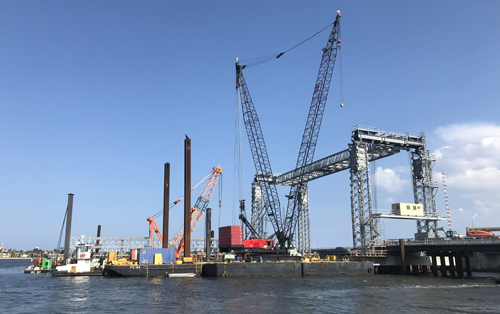 It was particularly important when planning the detour that the temporary structure have superior structural strength, reliability and durability as the bridge is required to be lifted every 30 minutes for vessel passage. Acrow Bridge VP Engineering, Scott Patterson, said, “Lift bridges always pose technical challenges and there were many steps involved in the planned installation of the temporary bridge, requiring close coordination between Acrow’s mechanical, structural and electrical team members and the contractor. 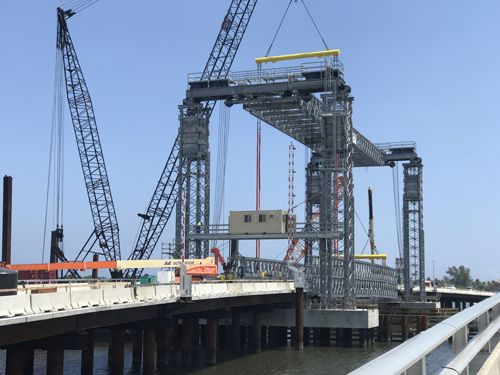 The lift span, towers and machinery span were all assembled from Acrow truss panel components on-site and nearby.